This post is sponsored by Windows by Melissa. Today I'd like to take a minute to introduce you all to one of my fabulous sponsors: Windows by Melissa. 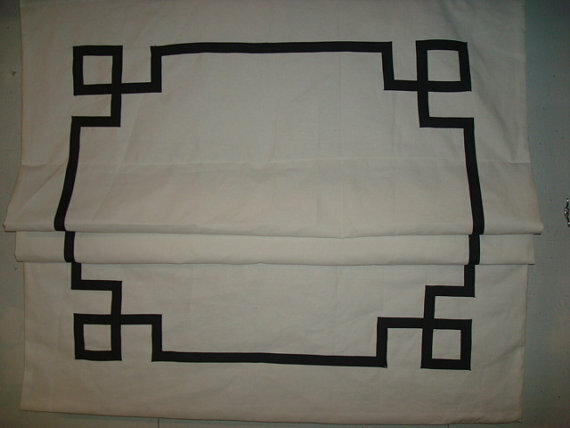 Windows by Melissa is a great etsy store featuring custom made window treatments and pillow covers. Check out some of her beautiful creations. I'm really loving this Imperial Trellis roman shade. I think I might *need* one of these. One of the things that is really special about Melissa's business is the fact that they love to give back. Here is what she has to say about her company. We are a team of six whose ultimate goal and mission is to clothe your bare windows. We pride ourselves on providing attractive, functional, safe and affordable window coverings. We are also dedicated to helping in our communities. As a special thanks for our success, we have decided to give back to our community by donating $5 of every order to a worthy cause each month. You can read more about our sponsorship program on our blog under "Sponsorship Program" in the top bar. Or read about past sponsor families under the label "monthly family sponsors." If you know of anyone to recommend for our sponsor program we welcome a write up to our email where we will review and consider the cause. I have enjoyed reading about some of the sponsor families on Melissa's Blog...and getting some practical information about window treatments as well. In addition, every Tuesday she has a giveaway on her blog...so make sure and visit! And she also offers coupons for her shop regularly on the Windows by Melissa Facebook page. Just a couple of things to keep in mind if you don't happen to be the lucky winner of today's giveaway. And just what is today's giveaway, Wendy? you ask. Well, today Melissa has generously offered to give one lucky reader of The Shabby Nest two 20" pillow covers in Dwell Studio's Bella Porte in Citrine!! Leave a comment on this post for a chance to win. It's as simple as that! This giveaway will be open until Tuesday, February 21 at 11:59 pm MST. A winner will chosen at random and announced here on the blog later in the week. This post was sponsored by Windows by Melissa. The opinions expressed are 100% mine. Love the first window treatment you have on your blog. The colors and patterns would go beautifully in my kitchen once we redo it! What a fabulous giveaway!!! I love the pillows - gorgeous color. I'm in LOVE with those pillows!! Thanks for giving them away! love the color of these pillow cases!! Beautiful work! And the pillows are gorgeous! I love the simplicity of your window coverings... they are elegant and yet fun! Love the bright pillows... they'd brighten anyone's mood! 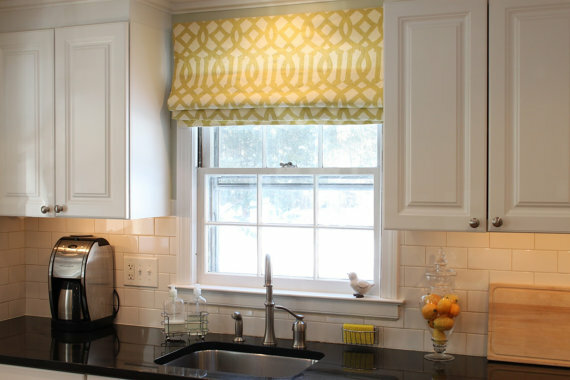 That Imperial Trellis roman shade would look awesome in my kitchen! Thanks for the chance! Love these pillows! I would love to win them!! The pillow covers are really pretty and I'd love to win them. I've been looking for bedroom window treatments. Thanks for putting this shop on my radar! Beautiful pillows! Thanks for the giveaway! Now this is one give-away I'd love to win!!! I especially like the first and second styles. Such beautiful work. Thanks for letting us know about this. I'm off to check out her shop! would love to win this one! those shades are gorgeous and love the print on the pillow covers! This is an awesome giveaway - just what I need. Thanks for the heads up on this shop. I'd love to win... count me in!! I love everything about this giveaway, the pillows are gorgeous and would look amazing in my living room. I also love the window treatments, will have to check those out. I need a shade of some sort in our bathroom! I need 2 roman shades for my daughter's room. I'll check her out! I love that color!!! They'd be perfect in my living room! I love the pattern & the color is perfect for spring! Thanks for the wonderful giveaway! I love your choices of fabric - so simple yet so chic. I would LOVE to win those pillows for my new craft room! Beautiful pillows - love the color and hope I am lucky. Love the pillows AND the window treatments! Those pillows would totally go in my family room. Thanks for sharing. Love the patterns...and the blog! These are great! I would love to win! Thanks for the chance! I love her work and have actually looked around her Etsy shop before. Love, love the window treament, and the pillows are great. Would love to win them. Thanks for the chance to win then. I love the window treatments! They are gorgeous. Beautiful, I will need some of these at my new house! 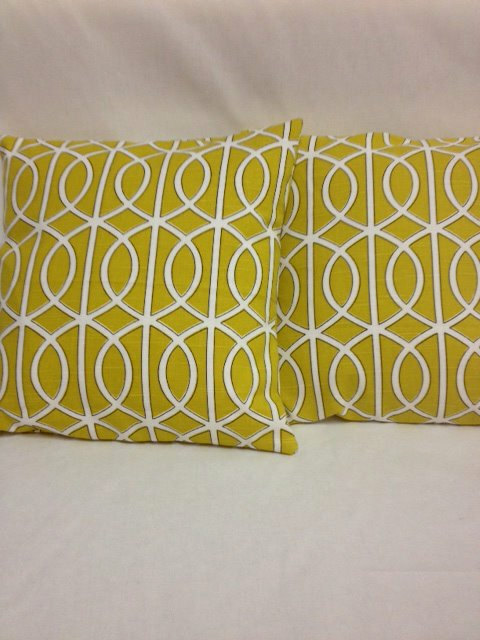 These pillows would look great in my new craft room and match the decor perfectly! Thanks for the giveaway! What a perfect giveaway! I love the way fabric can just finish a room. Love the pillow fabric, going to Melissa's store to see if there is something similar in a window treatment. Thanks! What gorgeous stuff! I so admire anyone with this kind of awesome sewing talent. And love that citrine! I love these window treatments. I was just looking for a window treatment in my kitchen! These would be perfect. I LOVE the window treatments are her pillow covers are beautiful! Please...please....please oh random name picker...Pick Me! These window treatments are so beautiful...wish I was so talented. LOVE!!!! what a great giveaway! Would love to win. Melissa also provides some fabulous window covering tips as well! I love the designs and color. Thanks for the giveaway. L-O-V-E the shades/pillow coverings- we are currently tackling a reno project at my uncle's (very 60's style) beach cottage and these would look fabulous! Thanks for sharing! I LOVE the window treatment!! I am lovin' those pillows! Can't go wrong with citrine! And the window treatments - woo! Eep! I hope I win, these have been on my wishlist forever! Sooooo pretty! Would love to have! Thanks for the giveaway opportunity! I would love to win and get some new pillows for my couch. Those pillow covers are fabulous! Wow! Love the Window Treatments! I would love to put them in my House. I have been thinking about adding some fun window Treatments with fun Patterns to my Mail living area, I will have to check out her stuff. The Pillows were amazing too. My mom says I have a Pillow Problem. That is that I can't get enough of fun Colors and Patterns of Pillows. I am Constantly adding to my Pillow collection. So fun! I think I need to go visit her Etsy shop! SWWOOOOONNNNN!